Portions of the parrot brain—long overlooked by scientists—could explain why they’re able to imitate what people say. Parrots are one of the few animals considered “vocal learners,” meaning they can imitate sounds. Researchers have been trying to figure out why some bird species are better imitators than others. Besides differences in the sizes of particular brain regions, however, no other potential explanations have surfaced. By examining gene expression patterns, a new study published in PLOS ONE found that parrot brains are structured differently than the brains of songbirds and hummingbirds, which also exhibit vocal learning. In addition to having defined centers in the brain that control vocal learning called ‘cores,’ parrots have what the scientists call ‘shells,’ or outer rings, which are also involved in vocal learning. 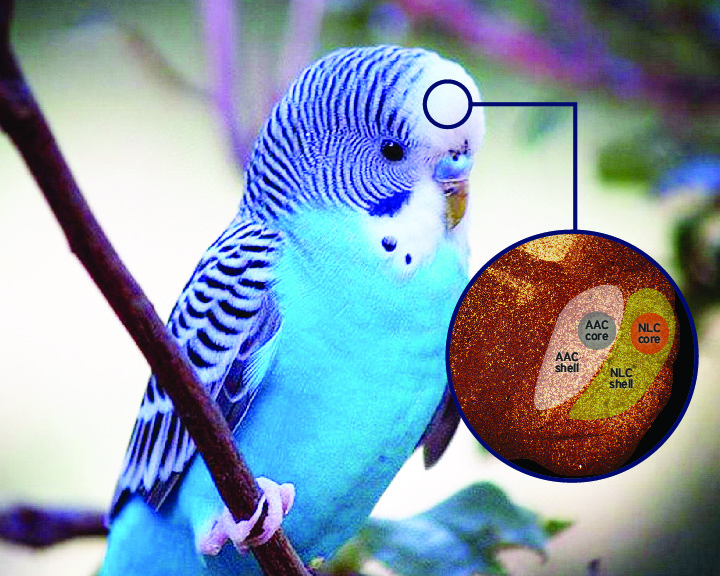 “This finding opens up a huge avenue of research in parrots, in trying to understand how parrots are processing the information necessary to copy novel sounds and what are the mechanisms that underlie imitation of human speech sounds,” says Mukta Chakraborty, a postdoctoral researcher in the lab of Erich Jarvis, an associate professor of neurobiology at Duke University and a Howard Hughes Medical Institute Investigator. Until now, the budgerigar (common parakeet) was the only species of parrot whose brain had been probed for the mechanisms of vocal learning. This team included researchers from Denmark and the Netherlands who donated precious brain tissue for the study. They characterized the brains of eight parrot species besides the budgerigar, including conures, cockatiels, lovebirds, two species of Amazon parrots, a blue and gold macaw, a kea, and an African Grey parrot. Even the most ancient of the parrot species they studied, the Kea of New Zealand, has a shell structure—albeit rudimentary. This suggests that the populations of neurons in the shells probably arose at least 29 million years ago. Before now, some scientists had assumed that the regions surrounding the cores had nothing to do with vocal learning. In a 2000 study, Jarvis and Claudio Mello of Oregon Health and Science University concluded that the core and shell were actually one large structure. These differing views caused confusion about the sizes of the brain regions important for vocal learning. Jarvis teamed up with Steven Brauth from the University of Maryland and his former postdoctoral fellow Sarah Durand to help reconcile this confusion. “The first thing that surprised me when Mukta and I were looking at the new results is, ‘Wow, how did I miss this all these years? How did everybody else miss this all these years? '” says Jarvis. “The surprise to me was more about human psychology and what we look for and how biased we are in what we look for. How specialized are parrot brains? The new results support the group’s hypothesis that in humans and other song-learning animals, the ability to imitate arose by brain pathway duplication. How such a copy-and-paste job could have happened is still unknown. Most of the bird’s vocal learning brain regions are tucked into areas that also control movement. These areas in parrots also show some special patterns of gene expression, which the scientists speculate might explain why some parrots are also able to learn to dance to music. “If that’s true, then we’ve answered a big question in our field that people have been wanting to know for many years,” Jarvis says. The Howard Hughes Medical Institute and the National Institutes of Health funded the project, with additional support from the University of Copenhagen, Framework Grants from the Danish Council for Independent Research, and the Copenhagen Zoo.